I'm after a HP Colour LaserJet CP3525 / CM3530 fuser kit 220V (RM1-4995). Please advise on the cost and delivery? Good morning, we were wondering if you supplied or knew of anywhere we could get an image transfer unit for a HP CP3525DN A4 colour laser printer? Unfortunately, we don't currently stock the HP CC468-67927 transfer belt you need for the HP Colour LaserJet CP3525DN printer. Any such supplies we do stock will be listed under 'Maintenance items' on this page. Please contact HP and they should be able to advise you where to purchase this part. Can you please advise when the HP Colour LaserJet CP3525DN set of premium brand recycled toner cartridges (pack of four) will be back in stock? We can confirm that the compatible 4 colour HP CE25 toner cartridge multipack is now back in stock and ready to buy. I need a waste toner bottle for the HP Colour LaserJet CP3525DN? Why pay more for your HP toner cartridges? 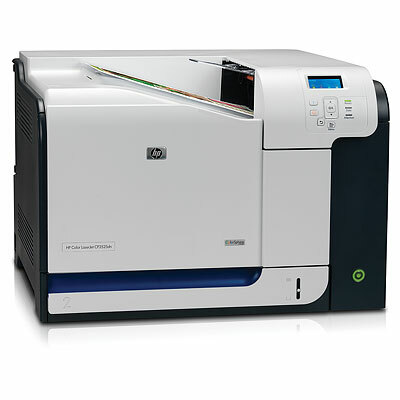 We offer free delivery as standard on all HP Colour Laserjet CP 3525DN toners so you can expect a discount price. Better still, you can relax in the safe hands of our award winning customer care team who make buying Colour Laserjet CP3525 cartridges easy and secure. Simply phone through your order free of charge or alternatively use the site's secure checkout. Remember, every Laserjet CP3525DN cartridge comes complete with a money back guarantee so you can be absolutely certain of getting value for money when your order from Cartridge Save.